Come enjoy a ride behind the worlds leading water sports boat. 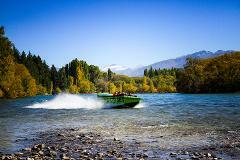 From wakeboarding and wakesurfing to biscuiting or skiing come experience the water on Lake Wanaka. Whether you just want to give it a go or increase your skill come take advantage of our professional instructors and custom built sport boat. With a wakeboarding tower, ballast tanks, power wedges and surf gates we are able to offer a large range of water sports to all abilities.Club Malibu have different sessions to suit most groups or individuals. With options from 30 minutes rides to hour private charters we are here to make your experience on Lake Wanaka one not to be forgotten. Wake boarding is so addictive! As the world’s fastest growing tow sport, it created its own lifestyle. Whether you’ve never done it before, or if you’re an expert, wake boarding is a sport that provides a sense of achievement and thrills for all skill levels. At Lakeland Wanaka our professional instructors will have you on your feet in no time teaching you from the beginning starting with a dry lesson before heading into the water. By this stage you should be feeling confident about the techniques before you enter the water, making your learning experience safe and easy. Beyond the beginners, riders can be guided to enhance their abilities. Experienced riders can enjoy being pulled by professional drivers who also have a passion for the sport behind the world leading water sports boat. Wake boarding is a highly rewarding sport but does require an average degree of athletic ability. Any age and any level, everyone is welcome to have a go! Wake surfing is a thrilling sport that requires no previous experience to enjoy. Wake surfing is suitable for individuals of all ages and athletic ability. Less physically demanding than wakeboard and undertaken at slower speeds, wake surf is fun, safe and equally rewarding. Also, being close enough to speak to friends on the boat while riding, it’s the most sociable tow sport around. With expert tips and advice from our instructors coaching you along, you will be riding the wake in no time being able to enjoy a rapid progress in your riding ability. Within a very short period of time riders are comfortable on the endless wave and can begin the challenge of letting go of the rope and freeriding towards the horizon. Due to the slow speed of wake surfing you can start to learn basic tricks without the worry of crashing at high speeds. Requiring minimal skill tubing is the easiest of all tow sports, and as such is a water sport truly accessible to families and thrill seekers.